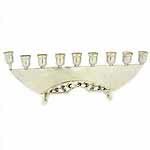 Sterling Silver Menorah. Decorated with enamel. Base diam. 3.6\' (9.1 cm). Weight 6.9 ounces (197 grams).